Penalty is the name of a photography project which has collected hundreds of 'found objects' in the form of footballs. These have been washed up on beaches around the world. Mandy Barker has shared a range of images here. Here is the rationale for the project, from the website. The series PENALTY aims to create awareness about the issue of marine pollution by focusing attention on the football as a single plastic object and global symbol that could reach an international audience. The project involved the collaboration with members of the public from around the world after a call via social media for people to collect and post footballs they found in the sea or on the shoreline. In total 992 marine debris balls were recovered from the world's oceans in just 4 months. 769 footballs and pieces of, with 223 other types of balls were collected from 41 different countries and islands and from 144 different beaches, by 89 members of the public. The recovered footballs have been incorporated into a series of 4 images, each showing the mass accumulation of footballs within areas of The World, Europe, United Kingdom and a collection made by a single member of the public. The diverse scale of these collections show both one persons determination to portray the problem of ocean debris at an individual level, whilst 89 members of the public around the world helped represent the issue on a global scale. 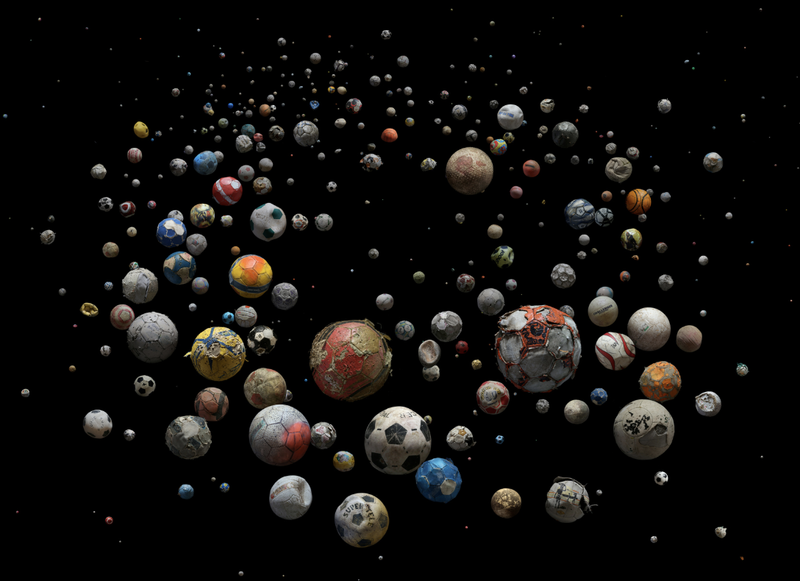 In addition to the 4 images created, 32 single marine debris footballs were selected from different countries and photographed individually to represent a timeline from their predicted age, estimated by the printed titles and names that appear on each ball. 32 is the number of synthetic leather panels that originally made up the traditional football and also is the number of qualifying teams in the World Cup Finals. The FIFA World Cup 2014 was the catalyst for the creation of this project to be able to raise awareness during an international sporting event. The series title has a double meaning; PENALTY is a punishment for breaking a rule in the game of football, and in relation to this project, a PENALTY is the price we will all pay if we do not look after our oceans by managing the over consumption of plastic and becoming responsible for its disposal.